I firmly believe that every mother needs to experience her pregnancy, birth, and postpartum period supported by those whose personalities and philosophies make her the most comfortable and in the environment that feels safest to her. I offer a free, no-obligation initial consultation visit to see if home birth and my services are right for you. Topics for the consultation are based on your questions; these might include homebirth safety, my services, costs, nutrition, and/or pre-conception counseling. Good nutrition is foundational to a healthy pregnancy and birth. Nutritional counseling, including food and supplemental sources is an integral part of my prenatal care. Because health and nutrition before pregnancy can dramatically affect both mother and baby, I also offer pre-conception counseling. Prenatal care is designed to build a trusting and collaborative relationship between midwife and client. I offer prenatal care in the comfort of your home. Prenatal care includes monthly visits until 28-30 weeks, then twice monthly until 36 weeks, and finally weekly until birth. Prenatal care includes routine assessment of mother and baby; blood draws for routine and additional blood work as needed; education about, discussion of, and scheduling for desired additional procedures such as ultrasounds; lots of time for questions and answers; education and information on a variety of prenatal, birth, and parenting topics as desired; and the formation of a collaborative relationship founded on trust between the midwife and the expectant mother and her support people. You can expect you initial prenatal visit, which includes a medical and maternity history and a more extensive physical exam, to take 1-2 hours. Subsequent visits are usually about 30-60 minutes. I will also endeavor to facilitate the opportunity for you to meet your planned birth assistant at one or more prenatal visits. My goal is for my clients to enter labor completely comfortable with their care providers and confident in the care they have chosen. Birthing in your home naturally puts you in control. I am on 24-hour call for my own clients. I am available by phone at any time, and come to your home at your request in labor, or when we decide together that the timing is appropriate. My practice is to bring a trained assistant to help handle any emergencies and provide an extra set of hands during the busier parts of labor and birth. My primary role during births is to monitor mother and baby as indicated and respond to any signs of possible complications. Except in the rare circumstance of urgently life-threatening situations, nothing is done without ample time for discussion, questions, and informed decision-making by the client. Women birthing in their own homes are free to choose the support people with whom they feel most comfortable surrounding themselves. 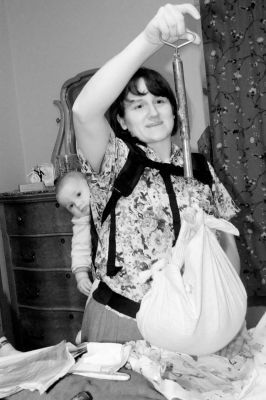 Besides monitoring the health of mother and baby, I can give you and your supports privacy, provide more hands-on physical comfort measures, and/or provide verbal encouragement as desired. I encourage a variety of measures for handling the intensity of labor sensations. 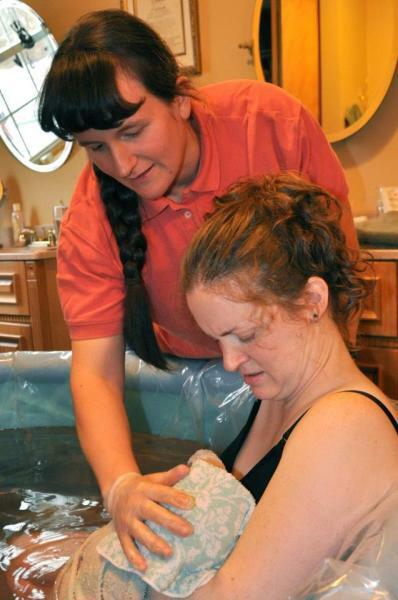 These may include: water immersion for labor and/or birth (waterbirth), movement, position changes, touch/massage, music, and/or deep relaxation and breathing. Effective coping strategies vary for each woman, each labor, and different parts of the same labor. My goal is to remain flexible and work with you through prenatal preparation and the birth process to facilitate your best experience. Should hospitalization in labor become needed or desired, I accompany my clients to the hospital and continue in a labor support and educational role. I am able to provide midwifery care to women who have received up to one cesarean section and wish to plan a vaginal birth at home (VBAC after 1). 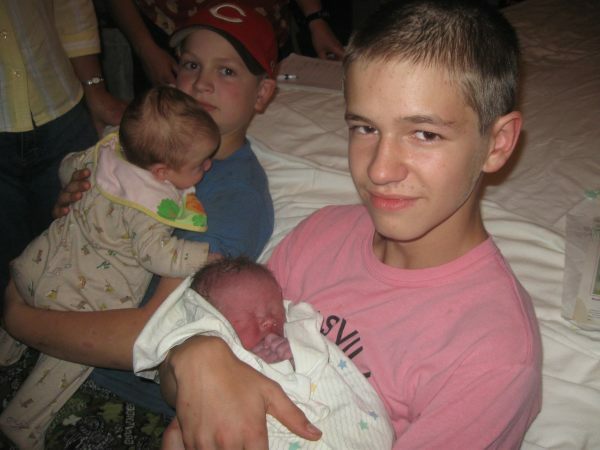 Routine newborn care includes immediate skin-to-skin between mother and baby. I follow an as-needed approach to immediate newborn management; nine times out of ten I will help you lift baby on to yourself, cover you both with a warm towel, and observe to ensure your baby is transitioning well to life outside the womb. I suction only when needed and assist with cutting the cord whenever you are ready, preferably after it has stopped pulsing. If your baby is part of the one out of ten who needs help starting to breathe, I am usually able to do everything that is needed with your baby on your abdomen or chest. When you and your baby are ready to try breastfeeding, I can offer support, suggestions, and assistance in getting breastfeeding off to a good start. I perform a full newborn exam at your side and offer the routine newborn procedures including eye ointment, vitamin K, and newborn metabolic screening. At your follow-up visits, I will also check the baby and address any questions or concerns you have. Although my formal newborn care ends at six weeks, I am always happy to help with breastfeeding questions or concerns and help you find a care provider to help if I cannot adequately assist with your situation. ​​For many women, one of the best parts of birthing at home is being tucked into their own bed to sleep within a few hours of giving birth. My care includes monitoring both mother and baby for at least two hours after birth, longer if any complications arise. While my assistant and I help with the birth of the placenta, monitor your blood pressure and make sure that your bleeding is not excessive, we also give you time and space to bond with your new baby and help you with getting up to the toilet and showering or bathing if desired. We help clean up after the birth, encourage you to eat, and provide instructions for the next days. I return to your home to check on you and your baby approximately one day, three to seven days, and two weeks after your birth. A final postpartum visit at four to six weeks concludes my formal midwifery care. However I always welcome phone calls with questions or concerns and love it when my clients stay in touch. My goal is to help midwifery be an accessible option to families in our rural region. While I do bill Idaho Medicaid, I am not currently in-network with any other insurance companies, so coverage depends on the individual plan's policy on covering out-of-network licensed midwives for home birth. I am happy to work with you to ask your insurance the necessary questions to know what to expect. My policy is to have clients pay the fee by 34 weeks of pregnancy and then seek reimbursement from their insurance company. I will provide the appropriate receipts for submission to the insurance company after your birth. Because I want to keep homebirth midwifery as an affordable option to local women, I do offer flexible payment options for those experiencing financial hardship. Feel free to call to discuss your situation.